The Horn Concerto, originally written in 1971 for soloist with brass band, is here heard in a recent orchestral arrangement, played by Richard Watkins, a leading horn player of his generation. Each of the Concerto’s three movements displays a different facet of the French horn’s character: serious, lyrical and playful. Aztec Dances began as a substantial piece for recorder and piano. It was reworked for flute and piano at the request of Wissam Boustany, who here performs the final version, for flute and ensemble. Its vivid colours and ritualistic character were inspired by a British Museum exhibition exploring Aztec culture. Like Aztec Dances, the Concerto for Orchestra was revised twice. Its interim title, ‘Contrasts’, conveys the essence of the work, varieties of character and orchestral colour being key to it. 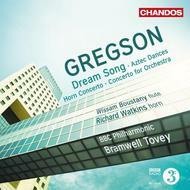 Dream Song was commissioned to share a concert programme with Mahler’s Symphony No.6. The essence of Mahler pervades the whole of this work which aims to create a parallel musical world to the Symphony.